Things don't always go according to plan when you're trying to hunt an orc. Sometimes, things can get a little wacky—especially if you happen to encounter a glitch. 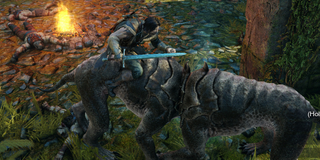 Now that Shadow of Mordor has been out for a few days, people are documenting some of the glitches they've come across. Take the one above, for example—a screenshot uploaded by neoGAF user GavinUK86. Two caragors joined by the face, making a sort of caragor centipede. Eww. Most glitches I've seen floating around are a bit of a hoot like that. Here are some of our favorites. Personally, I think watching the lead-up to the glitch is important here, so you can get a sense of how the player experienced the glitch. But if you don't have time for that, just skip to the 2:15 mark, where you'll see a warchief glitch onto a corner. Suddenly, it decides to spew out over a dozen introduction's worth of dialogue. Definitely a glitch, but I like to pretend it's more like the warchief losing his mind right before death, because that makes it freakier. Woah. Suddenly, Mordor becomes a lot less gloomy and a lot more trippy. Ah, a classic. This type of glitch happens in nearly every game, but in this instance it's funny because it happens mid-orc grab. Running around in circles, never noticing that you're crouched in front of them—even though your bodies are touching. Oh, Orc AI. You're so doofy sometimes. 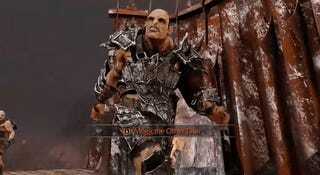 What about you, have you encountered any funny or notable glitches while playing Shadow of Mordor? Let us know in the comments.